This handmade card makes a stylish 50th wedding anniversary card. 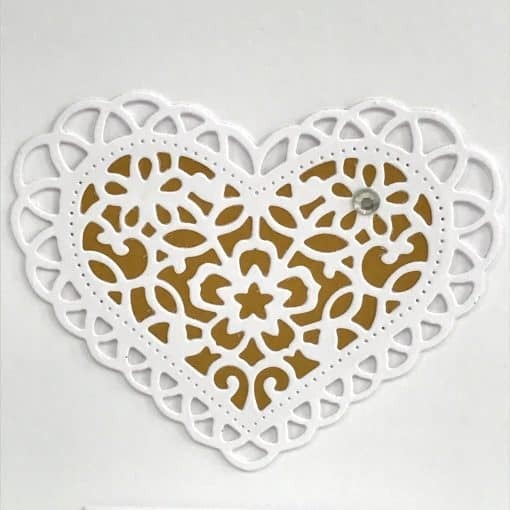 The lace heart has been die cut by hand and mounted onto a gold background. A clear diamante has then been added for that finishing touch! This card comes with the wording “50th Wedding Anniversary” on the front. If you would like a personalised message then choose this option and then provide the wording required for the front of the card. Beautiful decorated card. I had ordered this item for my parents’ 50th wedding anniversary. They just loved it. The ordered card also arrived quickly and it was all packaged with care and a personal note. Thank you very much.